Hand-made padded instrument bags for all your favorite flutes and whistles. Protective yet beautiful. These sack-style whistle cases come in four sizes/styles. SASSY SACK SHEPHERD , and the new SASSYPACKER. CLICK HERE To see what we have currently available. This larger flat case is designed to hold 3 whistles, D, C or Bb. 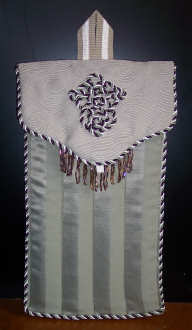 Custom Color or Fabric - adds $20 plus any additional cost of fabrics. Add $20 for a Small Hand-Tied Celtic Knot on top flap. These are also good for holding Bodhran Beaters! Please allow 6-8 weeks for delivery, though we usually keep a good supply of these on hand for quick shipment. This longer version of the SassySackSuper is designed to hold 1 Low D or C whistle. 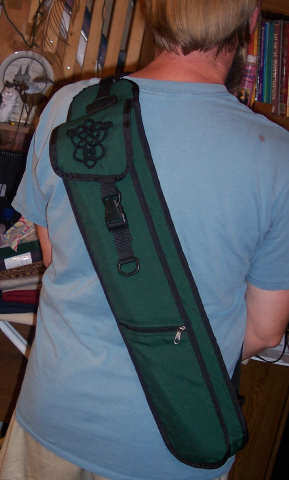 Add $25 for a Hand-Tied Celtic Knot on top flap. 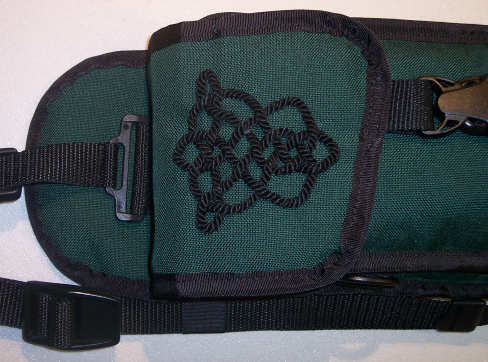 This larger flat case is designed to hold 4 whistles, D or C.
Add $25 for a Large Hand-Tied Celtic Knot on top flap. wear it back-packing, and will work well for anyone who needs to keep hands free. over the shoulder. It makes it hang nicely and comfortably. The strap is adjustable. in the front section, with a pocket at the bottom to hold necessities. Optional Celtic Knot shown on top photos. Vertical dividers can be added to separate whistles. to make practical, protective, yet attractive cases to house your Tin Whistles and Flutes. We add ScotchGuard(TM) protection to the fabrics to help them last and remain beautiful after use. and design are frequent, as experience and inspiration move us. See our GALLERY for a sampling. Click on the "@" symbol below to email for a custom quote. If you find errors or broken links, please let us know via e-mail.